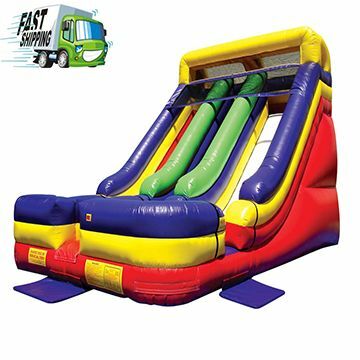 Double Lane Inflatable Slide from Partytime Inflatables is a top rental inflatable.Great for any type of public event or party in Ottawa, Ontario. T.S.S.A Certified Inflatable Product Dimensions: Length: 27'0" (8.23 m) Width: 19'6" (5.95 m) Height: 18'0" (5.49 m) Weight: 575 Lbs. (261 kg) Please contact us before hiring another provider. Ontario Laws require procedures to be followed prior and during your event. Injury Lawsuits can effect all parties involved and can be avoided by hiring a professional company that puts safety first.